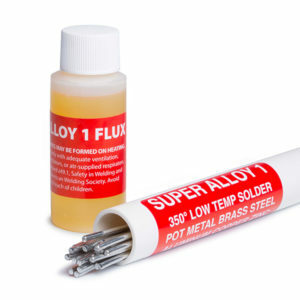 Super Alloy 1 is an aluminum solder that flows at such a low temperature, it can even be used with a heat gun on small aluminum parts. Indirect heat is recommended with this product, as it has a 350°F working temperature. In addition to aluminum, Super Alloy 1 rod and flux will bond to many other metals without distortion to the parent metal. 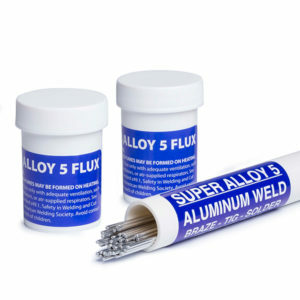 Super Alloy 5 is a 600°F brazing rod that bonds aluminum at weld strength. This rod and flux work synergistically, and the unique flux acts as an absolute temperature guide–turning to a liquid as it removes seen and unseen contaminates at working temperature. Super Alloy 5 works well on thin aluminum as well as thicker castings. (An oxyacetylene torch should be used on heavier aluminum and cast aluminum).